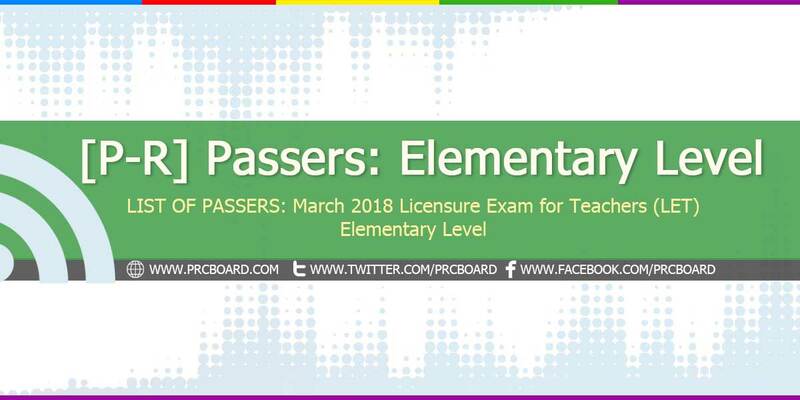 MANILA, Philippines - The official results, list of passers, top examinees, performance of schools and other important announcements for March 2018 Licensure Exam for Teachers (LET) both for elementary and secondary levels are released by the Professional Regulation Commission (PRC) 40 working days after the board exams. Below is the list of passers for March 2018 LET (Elementary Level) with surnames starting with letters P-R.
God kung ibibigay nyo po sakin to ngayon maraming maraming salamat po at kung di pa po ito ang tamang panahon na ipagkakaloob mo sakin to maraming maraming salamat po alam ko po na may plano ka pa for me. Maiintindihan ko po. Salamat po at Mahal po kita :* Naniniwala po ako sa iyo Panginoon. AMEN. God bless us all. God bless you March 2018 LET takers.. let's keep on praying..
the specified date is just target/ estimated timeline, results may be released earlier or later without prior notice. Alam ko di ka pababayaan nang nasa itaas..
lord hear my prayers.. I trust in you. WHAT TIME PO ANG RESULT ? wla pa vah ang resulta? wla pa paoh ang result? Kailan ba lalbas ang result? I’m praying that my younger sister would make it. God bless to everyone who took the exam. Trust God and have faith in Him. Congratulations in advance!